When I found out about a new website concept, Grabble, I had to share it on my blog. Like most other bloggers, I am au fait with sites such as Polyvore or Lyst, which enable you to create moodboards and wishlists which can be shared via social media. Grabble offers the same principle; an easily installed button for your search bar enables you to 'grab' items from any given website and pin it to a selected moodboard you choose. Create a lookbook, a wishlist, a trend board; the opportunities are unbounded and the best thing about Grabble is that it alerts you when items you've 'grabbed' go into the sale! 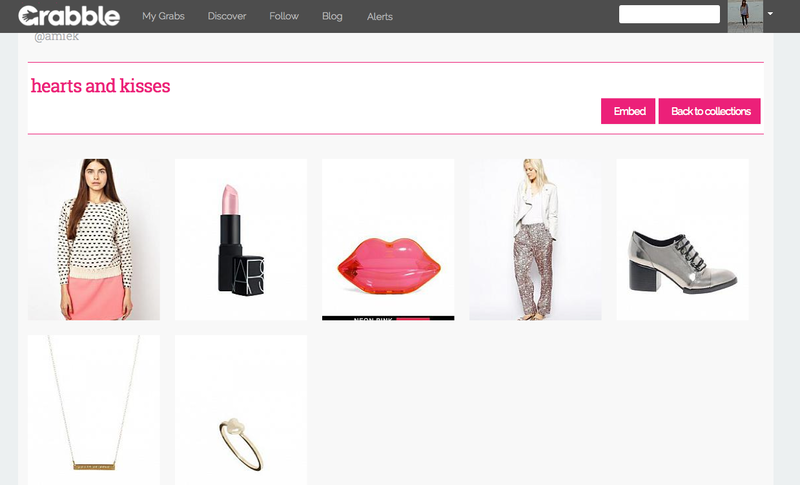 You can share your wishlists or moodboards with others quickly and easily via Twitter and Facebook, and you can also buy your items directly through the site simply by clicking on your image to be taken back to the website. I made a moodboard entitled 'hearts and kisses' which you can see above. It's a little Valentines inspired, and yes, I'm aware Valentines day has now passed but I loved the idea of mixing powder pinks with metallics and prints to edge up the idea of romance and also to prove that you can wear kitschy prints and pink the other side of Valentines day! Lip prints are set to be a definite trend for Spring and I love the Sonia Rykiel lip print sweatshirt I grabbed, it's such a cute way to embrace this trend and it isn't too obvious. However, I also love this Lulu Guinness clutch which is a definite statement accessory! I've been looking for a pair of silver shoes for ages, I love metallic accessories and they are actually very easy to wear, as they pair nicely with most colours and add a little luxe to any look. This block heeled brogue pair definitely fit my style and I love the contrasting black heel!